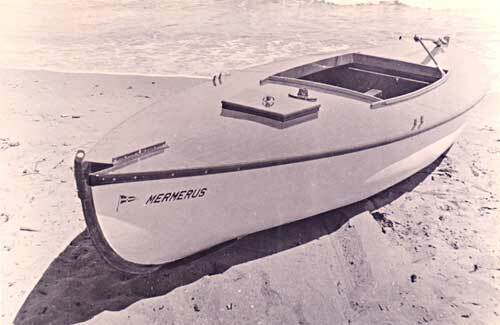 The Seahorse, an Australian designed sailing canoe, was developed in the early 1930s. The one design class possibly originated as a response to the uncontrolled enthusiasm of some paddling canoeists of the day to hoist a sail or two for the odd impromptu bumping race on Port Phillip Bay. The first Seahorse was built in Melbourne’s bayside suburb of Elwood in 1934 and was put in the water in November of that year for trials. After finding no flaws in the design, it was finally declared ready for the public and in the following year five more boats were built. 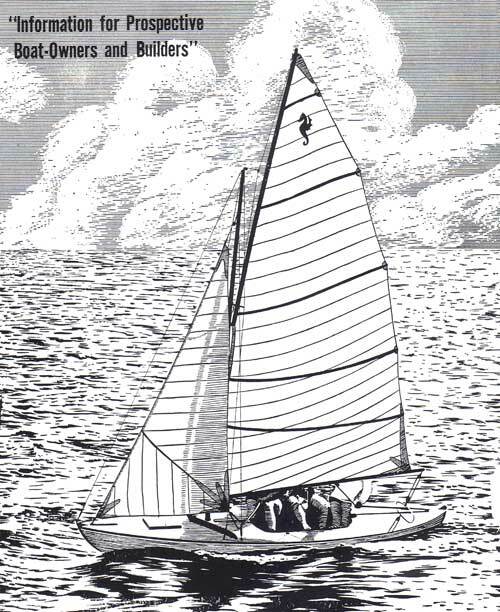 The Elwood Sailing Club specifications for the class, dating from this era, says that the class ‘originated from the belief that a small inexpensive yacht could be developed to serve both as a safe comfortable sailing craft for cruising and as a responsive, lively racer’. It seems that the design was actually developed at the Elwood club as an evolution to various hybrid canoes that had been sailing from this beach for years. 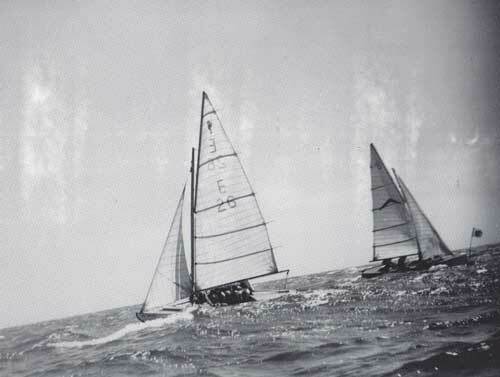 The Elwood club was originally a paddling canoe organisation, and the early adaptations to sail were seemingly put together as each individual owner saw fit. By 1939, 22 Seahorses had been completed, and all but one constructed by amateur builders. During the next six years only one boat was built owing to the war years and the policy of the club not to use materials, but 1946 saw the class again going ahead and at the end of that year 10 sets of plans had been sold. However, some of these ‘splashboards’ were little more than canvas arrangements propped up with sticks and made so they could be lowered when not needed. They were perhaps a carry-over from an earlier ‘lee-cloth’ arrangement found on some of the very early sailing canoes of the area. Two box-like pumps were usually fitted on either side of the centrecase, the valve inside worked by a piece of leather thong from the top. The water was let out directly into the case, and there was also a bung into one side of the case for draining the boat when on the beach. The rig was high peaked gunter, with a jib set to the stem. The total area for the working sails equalled 144 sq ft, with the spinnaker adding another 85 sq ft. Interestingly, silk or nylon was barred from the class as a sail material, and a loose footed or mitre cut main was not allowed. Inside ballast and winches for halyards were also prohibited, as was ‘any apparatus extending outboard which may be to support or assist in supporting a member of the crew outboard’. Planking was an easier than usual process, and must have suited the backyard builders that seemingly made most of the boats of this class. After moulds and ribbands were set up, the keel, stem and stern pieces and the ‘inside gunwales’ (as the specifications say) were all fastened to the mould. Then the ribs (quarter inch by two inches, at five inch centres) were steamed and fastened to the gunwales and keelson, but were set flush into the outside face of the keel. To make things even easier, it was also specified that ribs were to be fitted in two halves, that is joined in the centre of the keel, and not bent around the hull in one piece. Planking was therefore not rabbetted into the keel, but went over the top of the lot. The ‘gunwale planks’ went on first followed by the single ‘garboard’ strake, which was screwed to the keel and stem and stern pieces as well as being riveted to ribs. Planks were then fitted next to the gunwale and garboard strakes alternately until closing the hull with the last plank on the bilges, which from the shape of the gap created by the other planks would be short and pointed at each end. A gap for swelling was left between the planks, usually measured by placing a hack saw blade between them when fitting. One trick for helping fit the plank over the curve of the hull at the bilges was to soak hot water on the outside of the plank with rags. This swelled the fibres of the wood on the outside and helped bend it in towards the curved ribs. After being sealed up with the canvas, an outside keel was fitted along the bottom and any other pieces and fittings needed could be attached. Ted Montfort says that in the Seahorses’, and his own, heyday, they often sailed down Port Phillip Bay to the Mornington Peninsula, or over to the other side, for a bit of a holiday. ‘No one had trailers anyway, so sailing them was the only way to get them anywhere. In those days you could leave all your gear on the beach and no-one would touch it.’ The natural elements were another thing. ‘One time after a night at Sorrento, we woke up to find two of our boats gone,’ says Ted. ‘Either the tide rose higher than expected or we didn’t do the right thing when coming up onto the beach. So what was the fate of the Seahorse, and why has this class of boat all but disappeared? The generally held opinion seems to be that with the advent of newer materials and building methods, the design simply fell out of favour with the owner-builders that seemed to make up most if not all the Seahorse’s advocates. And yet, as a unique Australian development, the design certainly deserves its place in history. Indeed, given its simplicity and seemingly satisfactory performance, we may even see something of a renewed interest. Bill Richards, long time local of the area, remembers the earlier sailing canoes that were raced off the beach around Elwood before the Seahorse design was established. 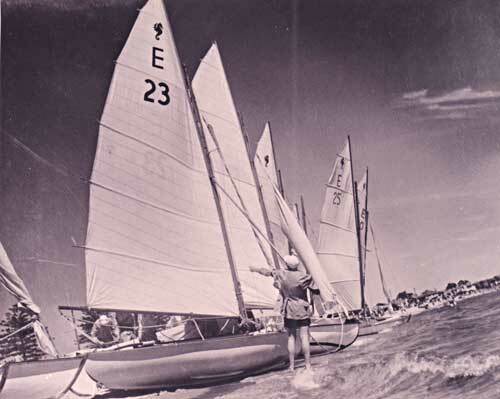 The Elwood Yacht Club was originally a paddling canoe organisation, and by the 1930s had established a large storage shed on the beach with racks for canoes up to three high. The canoes, says Bill, were of various shapes and designs but mainly 16 to 18 feet long. The earlier canoes were originally built with a high priority for lightness, the keel was accordingly very light, maybe two inches by one inch, and therefore unsuitable for a plate case. So lee boards were the standard of the day. Lee ‘clothes’ were another part of the effort to keep the canoes afloat. ‘These consisted of strips of canvas about eight inches wide running around more or less upright, but tending inboard, on each side of the canoe and fastened to the gunwale,’ says Bill. ‘The lee clothes were held up on the leeward side with spaced vertical timbers attached to the inboard side of the cloth. The idea was to have a propped up cloth on the lee side of the canoe, but an unpropped one on the weather side so the crew could still sit on the gunwale.